Collector George Chastain does it again! 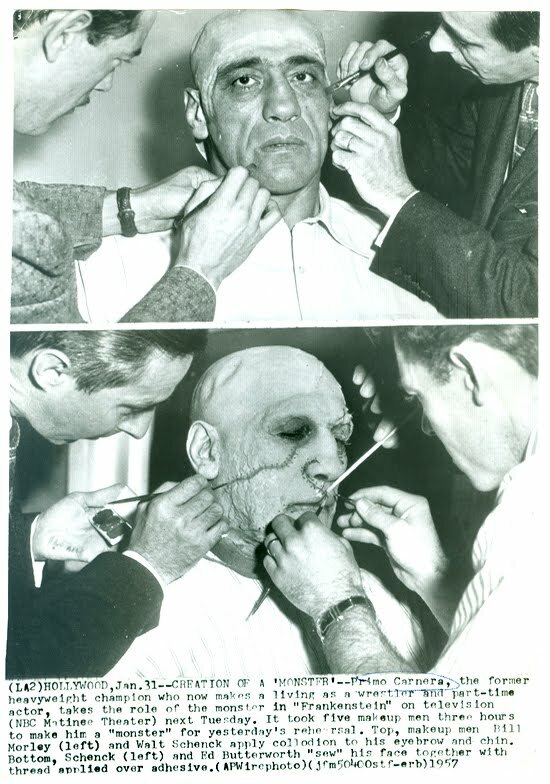 Back in November, we posted a fabulous photo he’d uncovered of Primo Carnera’s wardrobe and makeup test for the February 1957 Frankenstein episode of NBC’s Matinee Theater. Now, new photos have surfaced and, again, Mr. Chastain is generously sharing them here with Frankensteinia readers. The two AP wirepotos show boxer/wrestler turned actor Carnera submitting to makeup men for a January 30th dress rehearsal. The broadcast went out live from Burbank, California on February 5. The photos show two stages of the application. First, Carnera is fitted with a skullcap and, later on, the full-face makeup is completed with textured skin and a network of crude stitches. Five artists were required to transform Carnera into The Monster, three of them seen in the photos. Walter Schenck and Edwin Butterworth would work together again, twenty years later, on the 1977 film version of The Island of Dr. Moreau. William “Bill” Morley was makeup man on the AIP TV special, The Wild Weird World of Dr. Goldfoot in 1965. Matinee Theatre’s Frankenstein of 1957 is one of many lost programs from the early days of TV. These images, unseen for 55 years, are possibly the only remaining record of this historical broadcast. But wait… There’s one more! Check this post for the most stunning portrait you are ever likely to see of Primo Carnera as Frankenstein’s Monster! With thanks to George Chastain. Great stuff, Pierre; thanks again, George!